Over the past couple of weeks the main topic of discourse between family and friends alike has been the tragic, brutal and inexcusable beating of Bryan Stow a 42-year-old Paramedic and father of two who is currently in a medically induced coma and is hanging on for dear life. His only offense was wearing a Giants jersey to this year’s season opener at Dodger Stadium. These types of incidents at Chavez Ravine that used to be considered isolated seem to be happening with more regularity. Catching a ballgame with friends, while cheering for your favorite team and eating a Dodger Dog is as American as Apple Pie, and for all intents and purposes was a great way to spend a day. Nowadays however, cheering for the Dodgers has taken a back seat to ridiculing and insulting anyone who isn’t. 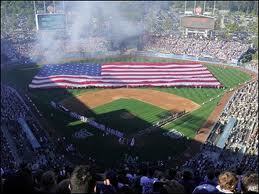 Before writing this post I typed in “Dodger Stadium Fights” on You Tube and was taken aback with what I saw and heard. The types of insults that were flying around were off the charts and were aimed at anyone, man, woman or child. It seems as though that some unruly Dodger fans are determined to pick up where the Raider Nation left off. During the many conversations I had about what occurred on opening day, one question kept coming to mind. “What would you have done if you saw this happening to someone?” I don’t expect anyone to put his or her own life at risk to help a total stranger, but the one thing that I hope no one does when confronted with this type of moral dilemma is nothing at all. Whether you're buying your FHA Loans VA Loans first home or moving up to a bigger one, the basic steps in the purchase process are the same.Home Loan Grants Our Purchase Service guides you throughBest Wisconsin Mortgage Broker this process, ensuring that you are Ill-prepared andHome Loan Grants receiving great advice every step of the way.